Have your say: cover for the Book of Joshua. 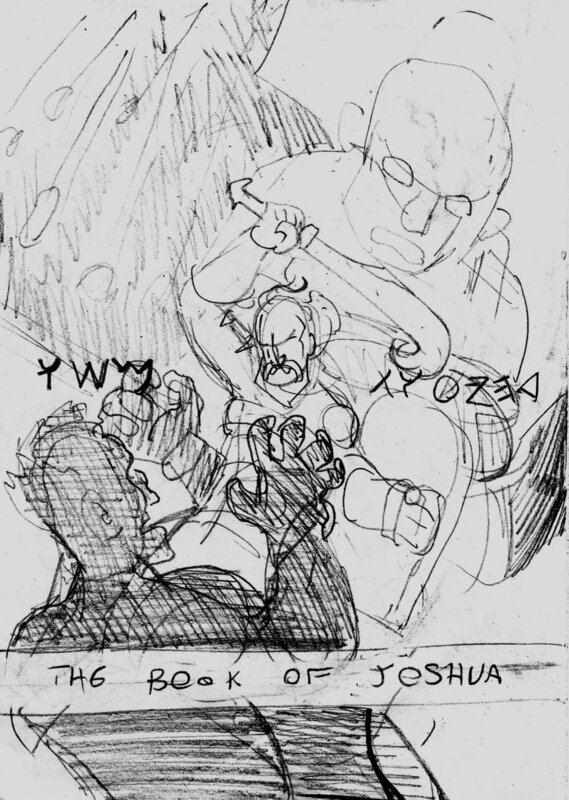 In this blog you can look at some of the development sketches for the new cover art for The Book of Joshua and give your option and ideas on which is the best and how to make it better. When I started I made a list of several elements or events I could include to give a feel for the story. Further development which has the same image as above but Caleb fighting the Anakim. You'll see from the sketches that I am fix using more on the Long Day of Joshua and the meteors shower than on the fall of Jericho which is the first think most people will remember about the book. Mainly because it's a much more significant miracle but also as it looks so exciting. I really liked the idea of having the sun and the moon on the cover to represent the Long Day. I also liked the idea of the meteors raining down and Joshua standing calmly amid the destruction (see below). It seems obvious that Joshua should be the focus of the cover as the Book bears his name, but it is tempting to have the "Commander of the Armies of the Lord" as He is Joshua's superior officer. Having a map of Canaan could be helpful to indicate the fact it is a story of conquest, but I'd also like to maintain the motif of having original period images on the cover. On a few the literal inclusion of ancient images is replaced with ancient artefacts which are drawn in but they could be photos. The words on the page say "After the death of Moses" in Paleo Hebrew, which is the first few words in the book, and is likely to be the original name of the book, just as "After the death of Joshua" is for Judges. Looking at the examples below please consider the aspects involved, the composition, the clarity and also how well it gives a feel for the story and themes of the book. Please leave a comment (here or on the social media post you came from) which you like from below and/or the covers and elements above. (Apologies that they are not equally developed and rendered). For reference here are the covers from the 2 pervious books of Ruth and Judges. You can buy the books here on the website now.